Tanger Factory Outlet Centers, Inc. has announced plans for a new Tanger Outlet Center serving the greater Fort Worth/Denton and adjacent metro areas. The new center will be a signature retail component of Fine Line Diversified Development’s Champions Circle, a 279-acre commercial mixed-use real estate development adjacent to the Texas Motor Speedway. When complete, this new retail destination is expected to contain approximately 350,000- square-feet of retail space and feature over 70 upscale brand name and designer outlet retailers. Tanger has attracted and signed leases with top name brand retailers including Nike, Levi’s, Banana Republic, Gap, Old Navy, Express, Skechers, Carter’s and Oshkosh. In addition, Tanger is presently negotiating leases with numerous other leading designer/retailers seeking to secure space in this dynamic location. “With a proven track record for developing best in class outlet centers and long standing retailer partnerships, Tanger Outlets is the company to get this project done and executed at a superior level of quality. They create lifestyle destination centers that not only provide a first-class retail experience, but also celebrate the culture of the communities in which they operate. Tanger is the ideal partner to make the vision for Champions Circle everything we had hoped. We look forward to continuing to work closely with them on a world class project at this premier intersection,” said Bill Boecker, President and CEO of Fine Line Diversified Development. The new Tanger Outlets center is expected to create more than 400 full and part-time jobs during the construction phase of the project and over 900 full and part-time retail jobs once the center opens. “We couldn’t be more thrilled and honored to have such a highly recognized national retail name like Tanger Outlet Centers become a great new addition to our outstanding family of Fort Worth-area businesses,” said Dennis Shingleton, Fort Worth City Council Member for the district that includes Champions Circle. The Dallas-Fort Worth Marriott Hotel: the popular four-star hotel, conference center and golf club continues to be a focal point of Champions Circle. Buc-ee’s Travel Center: under construction and slated to open in time for Memorial Day Weekend, Buc-ee’s latest location will have 100 gas pumps, 65,000-square-feet of restaurant venues and all of the high-end amenities travelers have come to expect at Buc-ee’s locations. Churchill Apartments: this 137 unit multi-family complex is nearing completion and will begin welcoming new tenants in June of this year to residences lining the Marriott golf course with easy walkable access to future restaurants and shopping. Gray Dove Apartments: a 700+ unit multi-family complex immediately adjacent to Churchill Apartments that is currently in the engineering and design phase of the project. Champions Shopping Center: a 540,000-square-foot power center immediately adjacent to Tanger’s site, filled with lots of complementary stores and free-standing restaurants. Highway Improvements: extensions on the southbound service road in front of the Tanger site are underway. Additionally, new on and off ramps are being constructed, plus a “Texas-U-Turn” which enables northbound I-35W highway traffic to enter Champions Circle without having to go through the service road intersection traffic lights at I-35W and SH-114. All highway improvements are designed to maximize access to Champions Circle and Tanger and are expected to be complete ahead of the Champions Circle retail component. This news release contains forward-looking statements within the meaning of federal securities laws. These statements include, but are not limited to, the development and opening of a new center, the tenant mix, the number of jobs and the amount of tax revenue expected to be generated, and management’s beliefs, plans, estimates, intentions, and similar statements concerning anticipated future events, results, circumstances, performance or expectations that are not historical facts. These forward-looking statements are subject to risks and uncertainties, and therefore, actual results could differ materially from those projected. For a more detailed discussion of the factors that affect the operating results of the Company, interested parties should review the Company’s Annual Report on Form 10-K for the fiscal year ended December 31, 2015. Those factors include, but are not limited to, the risks associated with general economic and real estate conditions, the risks associated with real estate development including obtaining necessary approvals, the availability and cost of capital, the Company’s ability to lease its properties or to meet its minimum pre-leasing hurdles on proposed new developments and competition. Tanger Factory Outlet Centers, Inc., is a publicly-traded REIT headquartered in Greensboro, North Carolina that presently operates and owns, or has an ownership interest in, a portfolio of 42 upscale outlet shopping centers and 2 additional centers currently under construction. Tanger’s operating properties are located in 21 states coast to coast and in Canada, totaling approximately 14.3 million square feet, leased to over 3,000 stores which are operated by more than 490 different brand name companies. The company has more than 35 years of experience in the outlet industry. 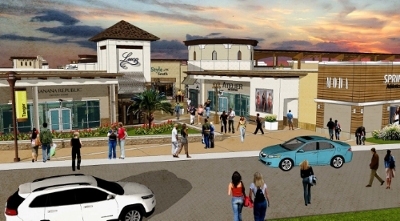 Tanger Outlet Centers continue to attract more than 185 million shoppers annually. For more information on Tanger Outlet Centers, call 1-800-4TANGER or visit the company’s web site atwww.tangeroutlets.com. About Fine Line Diversified Development, Inc.